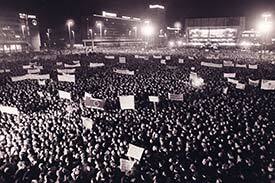 ABOVE: A news photo from the Montagsdemonstration of October 9, 1989. "We had planned everything. We were prepared for everything. But not for candles and prayers." East Germany's "Peaceful Revolution" didn't occur overnight, but the Monday Demonstrations of September and October, 1989 brought matters to a head in Leipzig and other cities of the German Democratic Republic, or GDR. After months of "Peace Prayers" in Leipzig's Nikolaikirche and other public protests, some 70,000 people gathered in the streets of downtown Leipzig on October 9 to demand reform from the SED (German Communist Party) regime. Thousands of police and military personnel were on hand to stop the demonstrations, and soldiers with machine guns were posted on rooftops to intimidate the protesters. Fortunately for the citizens, cries of "No violence" were heeded, and one organizer's ploy was particularly effective: The pastor of the Nikolaikirche suggested that marchers carry candles, which require two hands: one to hold the candle, the other to protect the flame from blowing out. With two hands occupied, protesters wouldn't be tempted to throw rocks! "The 8,000-strong security forces were opposed not (as expected) by a few 'gang leaders,' but by a great part of the population. This made violent dispersal of the demonstration impossible. In the following weeks, the SED tried in vain to hinder the public from further protests. The people of Leipzig were not satisfied by cosmetic changes. Through their courage, their determination, and rejection of violence, the people of Leipzig made history with the Monday demonstrations. Pictures of the protests of autumn, 1989 spread throughout the world. Determined people demanded democratic basic rights in an encrusted community. Leipzig--the poor cousin of the GDR--used peaceful means to express itself and laid the foundation for German reunification by means of a Peaceful Revolution." "Every 9 October, Leipzig pays tribute to these occurrences with many events--such as exhibitions, readings, discussions, the prayer for peace in the Nikolaikirche, and a democracy forum in the Gewandhaus." This article mentions early resistance to the SED government (including demonstrations and strikes in 1953), describes external factors that facilitated the revolution, and summarizes the demonstrations that occurred between September, 1989 and the first free multi-party elections in 1990. The Nicholaikirche, Leipzig's oldest church, was a center of peaceful resistance to the GDR's totalitarian regime. This page from the church's Web site offers a pastor's-eye view of the Monday Demonstrations and related events.